A bouncer is a must. You need to have one. Really. Yes, baby can lounge in a cat bed or on a posh pillow, but there’s no substitute for giving her a good angle on what’s up in the room and the ability to bounce herself a bit. She wants to see what you’re doing and who can blame her? There are a lot of bouncer options out there. Most play music, vibrate, and have a “bridge” with toys of varying intensities hanging off it for baby’s batting pleasure. (Don’t use the bridge as a handle to pick the bouncer up with baby in it. Trust me: they come off. That said, you really do want the bridge to be removable in case it doesn’t work for Junior and he’d rather just look around.) As a minimalist mama, I don’t think new babies should be swamped with lots of lights, electronics, whizzing things and massive doses of color. As a minimalist person, I don’t think my living room wants that either. The bouncer market begs to differ. 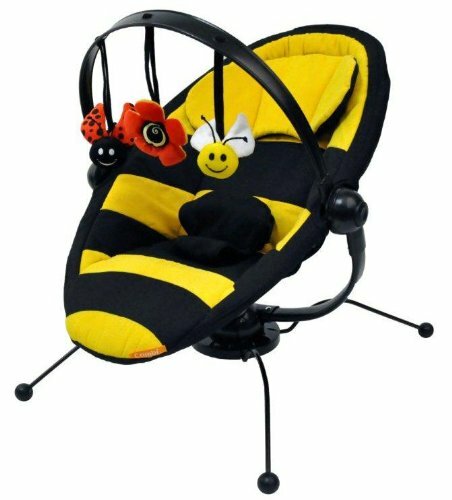 Anyway, my recommendation is to get one of the super basic ones and save the special features for your baby swing (in which your baby will likely be more comfortable anyway). 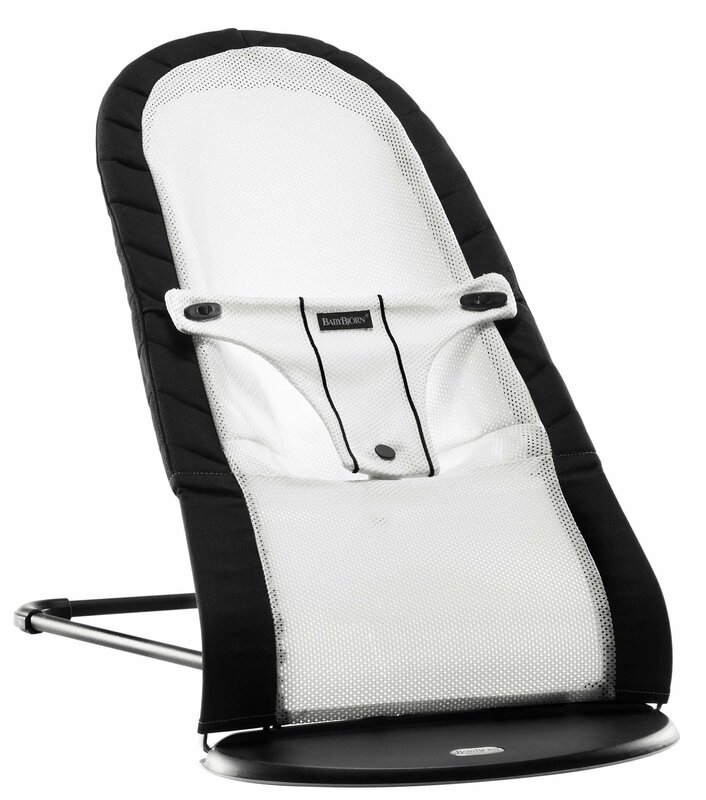 If you have a ton of room or the budget to get a second lightweight one to move around the house, sure, go for it and get the Mercedes model: Peg Perego makes one with surround sound, a canopy, and a seat with adjustable angles. Also: tasteful colors. But you’ll pay $170 for it, so there’s that. Along similar but much more annoying-sounding lines – although it does have cool-looking stripes – is the Magic Astro Bouncer, which costs $199 but requires all sorts of secondary purchases to get the kick pad and all the features working. My advice: avoid. And Baby Bjorn, coming in at $149, makes a sleek, no frills, fold-able model that I like a lot and would have gotten if I’d been able to stomach the price tag for something we used for less than a year. Down side with the Combi: you can’t remove the cover for washing. Ours doesn’t come off either and it wasn’t a problem since Astrid wasn’t particularly accident prone, but it’s something to consider. Good luck! And don’t stress too much about this purchase: a bouncer is really nice to have but if tiny Lyle doesn’t like the one you get him, you can always trade off on Craigslist – or just wait a few months and he’ll be crawling!! I’ve always liked Skip Hop‘s style and Astrid (and I) were really happy with their farmyard activity mat when she was tiny: soft fabric with some texture and crinkles for fun + the standard arches for dangling soft toys with their own small (and quiet!) features, all of it in tasteful primary colors with minimal electronics and garish extras. Done. A friend of mine registered for their latest play mat, which reminded me to check their site. The farmyard theme has been replaced by a treetop one that’s just as appealing, if not even more so. Or maybe it’s just my weakness for owls. At $75, it’s not cheap, but, for one of the only toys that an infant will use right away (covering play and tummy time) and will be on your floor for a whole year, I’d rather spend the money and skip the cheap-looking alternatives. Yay owls! 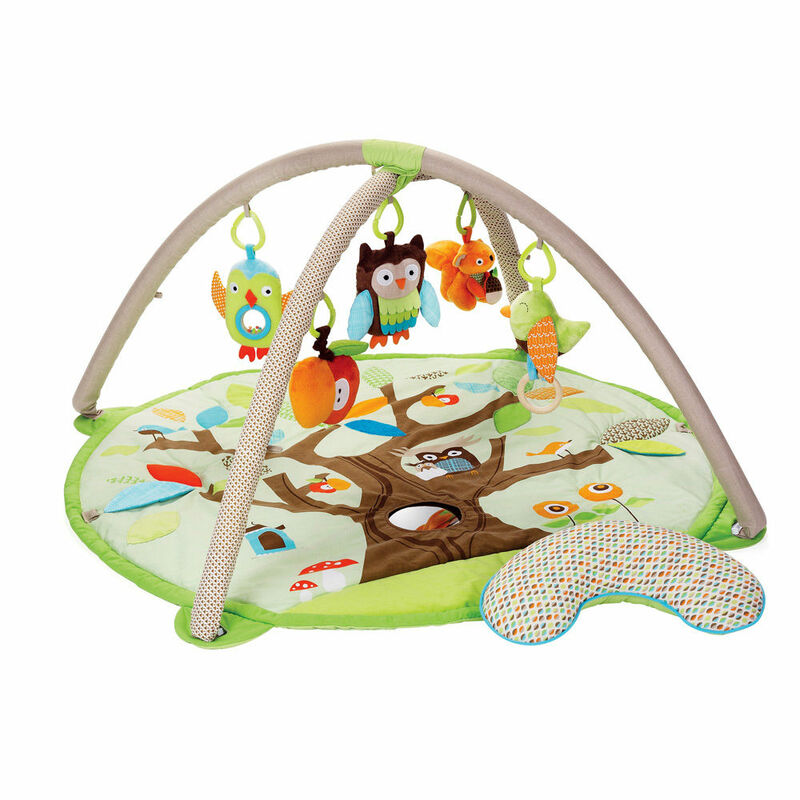 Skip Hop Treetop Friends Activity Gym, $75 at SkipHop or Amazon. Or check your neighborhood parents’ group to see if anyone’s ready to part with theirs – they don’t get beat up very much – but do get their share of drool (!) so wash it well before you use it. I have one word for you: pajamas. I have two more: ten dollars. At Bloomingdales. I know: I couldn’t believe it either. Like the New Yorker I am, I love Bloomingdales, but I don’t expect my affection to be returned inexpensively. My wonderful aunt brought Astrid a set of footie pajamas and, I can’t remember why, but I needed to exchange them. I headed down to the Bloomingdales baby department (yes, they have one at the much-smaller-than-New-York’s-and-not-nearly-enough-shoes-by-a-long-shot Bloomingdales in San Francisco – it’s in the basement by kitchenware), and discovered a whole little section of $10 all-cotton pajamas for babies. Crazy. They’re tucked in next to the Burberry and Ralph Lauren $60 pajamas and, in my opinion, for a tiny person who will grow out of them in 20 minutes, these are a much saner investment. A few of the prints aren’t my favorite, but just stick with the ducks and giraffes and your little one will still look tasteful. It’s not like she’ll be wearing them out to a major social event or show up in People’s “Celebrity Babies.” At least I don’t think so. If she will, let me know and I’ll find you some nice togs for that too. 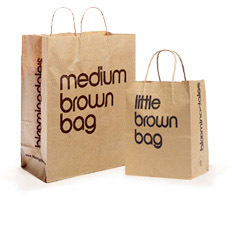 Not available on the Bloomingdales web site, so head into your nearest store. OK, so let’s be clear up front: I hate going into department stores. I appreciate that they’ve clumped everything together in one place for me, but, man alive do they give me a headache. Especially Macy’s. There is just too much stuff crowded all up on itself, plus it feels like the staff was hired back when department stores were cool in 1953. They’re well-informed but sooooo slow. And not cheerful slow either. God, I hate it in there. There are two things that will get me into Macy’s though: pillows (really, their sales are ridiculous) and onesies. Macy’s sells Carter’s plain and patterned onesies (or bodysuits or whatever we’re calling them) for less than anywhere else, including on Carter’s own site, usually $16 for four. Babies R Us and Target also carry the Carter’s four-packs of onesies, but they’re usually $20-$22 or unavailable, so unless you have coupons or there’s a sale, hit Macy’s instead and stock up. Trust me: I got hooked on the Carter’s onesies and did a fair amount of checking and re-checking while at Target and Babies R Us and it’s a frustrating experience. Babies R Us usually only has the white ones in-store, so to get their sale prices and the patterned ones, you have to pay shipping. Target’s prices are good, but their in-store stock is all over the place so, unless you get lucky, you’re paying shipping there too. So just schlep over to Macy’s and buy two sets of four in every size and you’ll be set for the next year (or two). Just make sure you take some sedatives ahead of time though because if you think the housewares floor is claustrophobic and irritating, just wait until you see the baby department. While you’re there, take a quick look at their First Impressions section of the baby department and see if they have any jersey blankets or good pajamas. It’s their house brand and the patterns and designs are usually more tasteful and subtle than the Vegas explosion going on on the rest of the floor. Oh – and pick me up some pillows while you’re there, would you? Note: Carter’s, kind of inexplicably, makes three lines of baby bodysuits, one labeled (logically) “Carter’s” and one called “Just One You” or, I thought, “Year.” Or “JOY” as Target will sometimes call it, and one called “Precious Firsts.” It’s confusing, but don’t worry about it: it’s all the same stuff – same quality, same company. I just had tea with our fantastic post-partum doula, Caroline, yesterday and she mentioned my swaddle round-up and a new swaddle on the market, the True Womb Sleeping Swaddle. I hadn’t seen it before so I thought I’d pass it along to all of you to see if anyone’s tried it and liked it (or tried it and not liked it). It resembles the Miracle Blanket but Baby’s arms are in little pouches instead of wrapped. Also: it closes with Velcro. A lot of Velcro, apparently, which Caroline and I (and a couple Amazon reviewers) agreed sounded pretty loud for late-night diaper changes. But who knows? Maybe it’s awesome. If you know, let us know! What the $)(! is up with all the blankets anyway? 1 sturdy, warm blanket for warmth and floor time. 2-4 lightweight inexpensive blankets (muslin or flannel) for general use (shade, clean-up, having in your bag for whatever comes up). 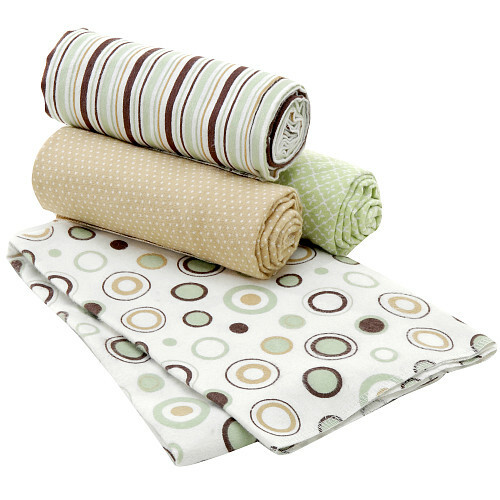 2 flannel, muslin, or, even better, jersey blankets for swaddling. Get them big enough to use for bedding later (47″ square is great). 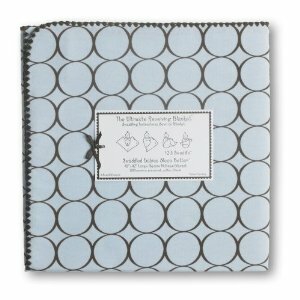 When I made my registry/shopping list pre-baby, it bothered me: web sites and books all recommended I stock up on “receiving blankets.” Since I would be busy with the delivering part, I assumed my excellent OB would take care of the receiving bit and bring along any necessary accessories, including blankets. What exactly is a receiving blanket? What is it used for post-reception? And why did I need, like, eight of them, especially since these same books and sites were adamant that only if I wanted to endanger the very life of my newborn would I ever think of putting a blanket in the crib with her before she was, say, twelve? And forget, “You will need 4-6 light receiving blankets and 4-6 heavy receiving blankets.” Just get a few (3-4) small-ish, regular blankets based on your climate and the time of year you’re due. Swaddling. The first few weeks of swaddling you’ll probably use blankets (vs. your other swaddling options). The hospital will send you home with a couple. If you aren’t delivering in a hospital or want some extra ones, buy them big so you won’t have to replace them in a month and you can use them on your toddler’s bed. Also, get jersey over flannel if you can because it’s softer and stretches better (= fewer broken swaddles later when Junior gets stronger). Jersey blankets are weirdly hard to find, but they’re out there. 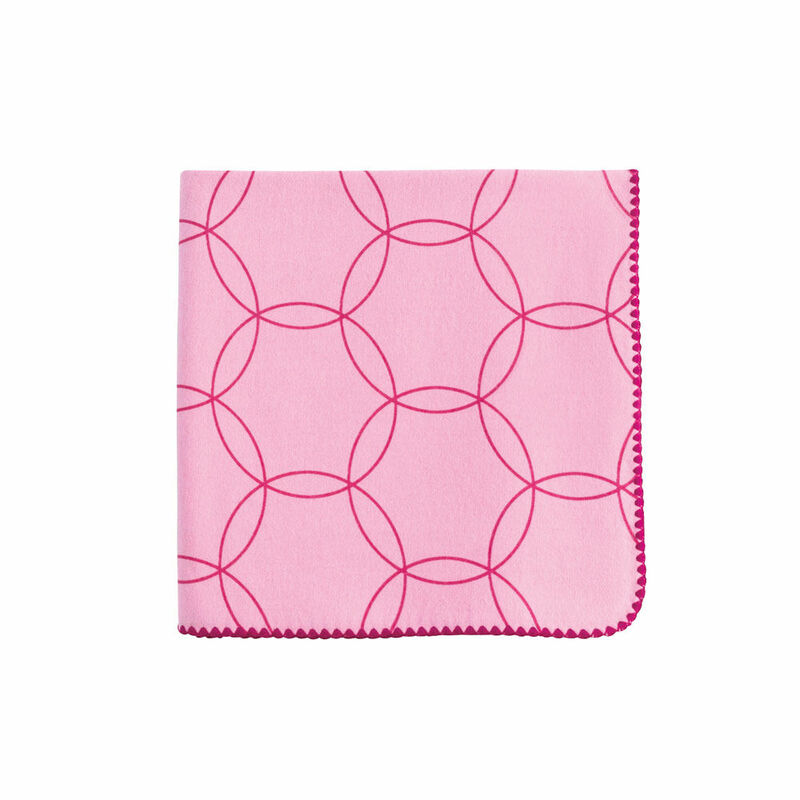 My favorite, favorite, favorite baby blanket still – for swaddling or otherwise – is Tea Collection’s Lotus Print Blanket (pink or blue pattern). 40×40″ and $35 at their site or in stores. Soft, washable, single-ply jersey. Best, best, best. Satsuma Designs makes one that will work: only 35×35 but the right weight and feel. $26 at Amazon, $32 at their store. Or Giggle’s Better Basics bold-stripe blankets ($36 online or at their stores.) And JJCole’s new line ($27 at BabyEarth) also looks about right, although I haven’t personally seen them. SwaddleDesigns makes large (46×46″) flannel swaddling blankets that wash well and will be big enough to last you through all your months of swaddling and will still be serviceable for your toddler’s bed. $10-$25 at SwaddleDesigns.com or $12-$20 at Amazon. Giggle’s Better Basics Ultimate Swaddle Blanket is similar, $25 at Giggle. Warmth. You will not put these in the crib with your baby at night or nap time, but you will still need them to shuttle baby to and from the car on a chilly morning and cozy him up in his car seat or stroller. It’s also nice to have something toasty and fuzzy to put under him in his swing or bouncy seat. You do not need more than two of these (one for use, one for while the other one’s in the laundry). If you live in Florida, you’ll be fine with jersey or cotton – no need to invest in one of these. If you have some warm, fleecy blankets around already, you can probably re-purpose those if they aren’t too big: just make sure to wash them in baby detergent first. American Baby Company makes a Little Giraffe knock-off for a fraction of the price, so that might be a good option if Uncle Warbucks doesn’t step up with the expensive option. 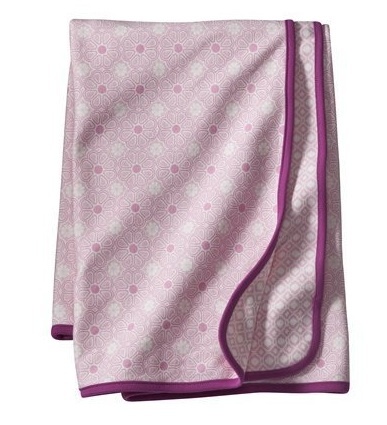 ABC Fleece Blanket with Satin Trim, $12 at Amazon. The floor. This might be the same as your Warmth category blankets, depending on how much you invest in your Warmth blankets and how dirty the floors we’re talking about are. Your infant will spend a lot of time on the floor, not all of it on a play mat. You will want to put little Violet down at Grandma’s house to get tummy time, at your new mom’s play group while you discuss the finer points of the dream feed, and in your kitchen while you mix yourself a nice cocktail (just after breastfeeding, naturally). I would recommend a pretty heavyweight material, so there’s some padding and warmth built in, and a very washable color and fabric. Shade. In the car, in the stroller and out and about in the sun, you’ll need something to shade Willemina from the sun. Her eyes will not like any sun for a few months and, while indirect sun is great for Vitamin D, you won’t want her in the direct sun for some time after that either. Many baby carriers (like the Ergo) come with a hood, baby slings will fold over her, and many car seats also have a collapsible hood that will come most or all the way over the baby, which is awesome for shading her eyes from the sun coming in your car’s back window or while she’s tooling around in your car seat/stroller combo. Disasters. Well, messes anyway. There will be spitting up, possibly a lot of it on a long car ride, for example. Maybe at a gas station outside Tahoe at night after a very long day. I don’t want to get too specific. Buy cheap and not too many and just have a couple in the car for the day if you’re out. 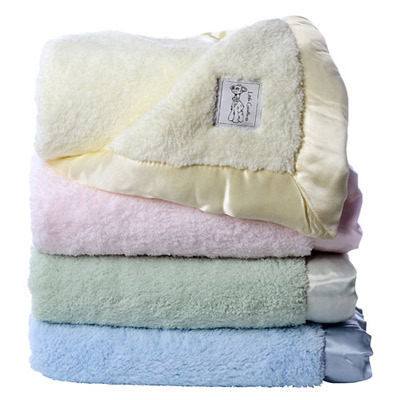 Carters 4 Pack Receiving Blankets, $17 at Babies R Us (This is what comes up when you search for “receiving blankets” at Babies R Us, but these are both too lightweight and too small – 30×40″ – to really work for receiving much of anything, particularly a swaddle (unless Bertrand is a very small baby and stays that way). 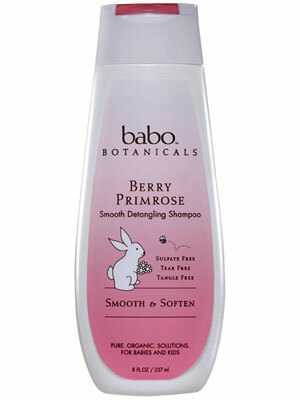 They are cute and very washable though and can wrap up a mess nicely. Or a baby in a pinch. A small baby.